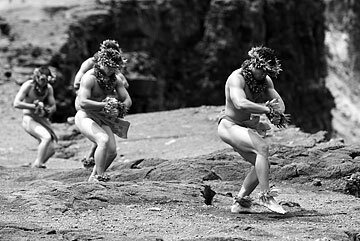 Among performers at "Waikiki by Moonlight" are Aunty Genoa Keawe and Keahiwai (below), as well as the hula halau Ka Leo O Laka I Ka Hikina O Ka La, shown above. Henry Kapono, Na Palapalai and Jeff Apaka are also scheduled to play. What: "Waikiki by Moonlight -- Vintage Meets Vogue"
Admission: Free; food, beverages, souvenirs and other merchandise will be available for purchase. » The OHANA East Hotel and Royal Hawaiian Shopping Center are offering event parking for $1 per hour for up to five hours, with validation from the shopping center's information desk; look for the Holoholo Parking sign. King Kalakaua Plaza (the Niketown building) will offer the same deal from 6 p.m. to midnight, and at the Pacific Beach Hotel, a $5 flat rate will be available after 6 p.m.
» Those looking for a Mother's Day weekend escape that includes "Waikiki by Moonlight" can find accommodations at the ResortQuest Waikiki Beach Hotel. Nightly rates start at $129, including a to-go Breakfast on the Beach. Call 866-774-2924. Nightly "Beachfront Waikiki by Moonlight" rates begin at $155 at the Outrigger Reef on the Beach and $195 at the Outrigger Waikiki on the Beach. Call 800-688-7444. When I was a child, the entire Chee clan -- some 50 people on my dad's side of the family -- would gather for summer Sunday picnics in Kapiolani Park. Midafternoon, my siblings and cousins would pile into cars of designated adult chaperones and head to Waikiki for a couple of hours of beach time. The older children would race to the ocean, their foam boogie boards and inflatable plastic rafts tucked under their arms. Uncle See Tong always stayed with us smaller kids, teaching us how to back-float and practice different swimming strokes. When it was time to get out of the water, Aunty Alice would appear with slices of watermelon and buttered sweet bread, which we devoured in minutes before heading to the Natatorium to dry off and change clothes. At the park, we'd start lively games of Frisbee, kickball and softball with our dads and uncles while the women hovered around picnic tables, talking story and setting out the potluck meal. Aunty Heong once made a big pot of beef stew, which my brother Russell knocked over trying to catch a fly ball. But no matter. We filled up on rice, salad, cornbread and cake that day and had a good laugh about the incident, and it was a story that would be retold many times at family gatherings. When I think of Waikiki, I also remember browsing for inexpensive knickknacks at Woolworth, savoring double-cut lamb chops at Canlis (remember its wall of orchids and kimono-clad servers?) and listening to the organist at Waikiki 3 Theatre play a tune or two before some Hollywood blockbuster lighted the big screen. They're all gone now, as is my youth, but the memories still linger. ON FRIDAY NIGHT, "Waikiki by Moonlight -- Vintage Meets Vogue," Hawaii's newest annual event, will rekindle a lot of that nostalgia along Kalakaua Avenue. Festivities first will recall the 1930s era, and as the evening progresses will move through the decades to present-day Waikiki. "Our board of directors recognized the need for a new signature event in Waikiki that would be consistent with the image of Hawaii that we want our visitors to take home with them," says Rick Egged, president of the Waikiki Improvement Association, which is spearheading the street festival (see sidebar). "They also wanted an event that would encourage residents to return to Waikiki. The nostalgic theme was appealing perhaps because we have seen so many changes in Waikiki in recent years. We wanted to pay tribute to its rich and colorful past while also showcasing what's best about contemporary Waikiki." According to Egged, "Waikiki by Moonlight" represents a collaborative effort between WIA and many businesses. For example, ResortQuest Hawaii is sponsoring the Entertainment Stage where local greats such as Na Hoku Hanohano award winners Aunty Genoa Keawe, Henry Kapono, Na Palapalai and Keahiwai will perform. Jeff Apaka also will be presenting a tribute to his legendary late father, Alfred. "Over the years, many kamaaina have come to believe that Waikiki is just for visitors, but 'Waikiki by Moonlight' will prove that's not true," said ResortQuest Hawaii President Kelvin Bloom. "At the event, visitors and island residents can mingle as one ohana (family), enjoying all of the wonderful diversions that Waikiki offers, from world-class cuisine to entertainment to fashion. ResortQuest Hawaii is pleased and proud to be presenting an outstanding entertainment lineup that pays tribute to talented songwriters, singers and musicians who've helped bring Hawaii to the world for the past 70 years." 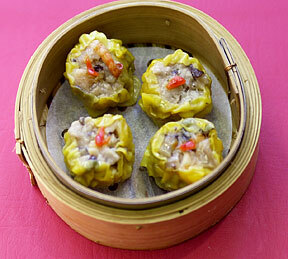 Seafood siu mai from Seafood Village. ALSO FEATURED will be hula performances and a "Vintage Meets Vogue" fashion show during which a selection of Hilo Hattie's latest styles will be modeled, along with favorite outfits from the past and creative designs for the future. 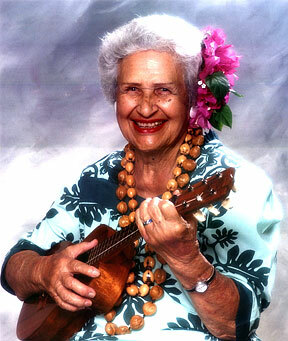 You could also find yourself on stage by entering the vintage aloha wear contest. Food will be another big draw. 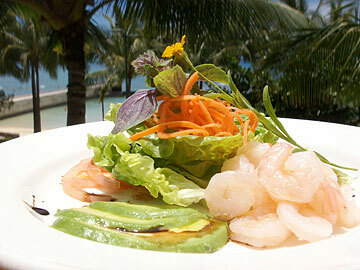 Among other specialties, you can sample Lobster Quesadilla with an Avocado Mousse from Tiki's Grill & Bar; Pulehu Salted Beef, kiawe wood-grilled tenderloin beef on a sugar-cane skewer from Neptune's Garden; Thai Curry Beef Satay with Honey Miso Pine Nut Sauce from the Top of Waikiki; and Jasmine Tea Smoked Shrimp Salad from the Hyatt Regency Waikiki Resort & Spa. If you've always wanted to learn wood carving, lau hala weaving, Hawaiian quilting and lei making, you'll get the chance as well. Skilled artisans will be demonstrating and selling these and other arts and crafts. You'll also be able to take an ukulele lesson, peruse several models of ukuleles and purchase both authentic vintage merchandise and quality reproductions, including Hawaiian posters, photographs, record albums, menus, sheet music, aloha shirts, tikis and hula girl figurines. "For seniors, 'Waikiki by Moonlight' no doubt will stir up many fond memories," says Egged. "It'll also be an event the younger generation will appreciate. They may not have been around when Don the Beachcomber was Hawaii's most popular watering hole, when the Moana and the Royal Hawaiian were the biggest hotels on Kalakaua Avenue or when Duke Kahanamoku was surfing and paddling canoes by Diamond Head, but they can hear the stories, listen to the music and look at photos and memorabilia from those eras. In that way they can experience the magic of old Waikiki." 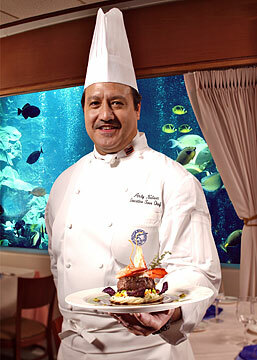 Pacific Beach Hotel chef Andy Nelson presents one of his creations. Food will be central in the festivities. Above, Tiki's Royal Maile Salad. 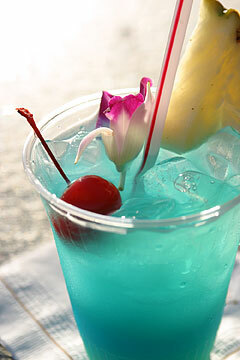 A Blue Hawaii tropical drink. "Waikiki by Moonlight" is the newest event presented by the Waikiki Improvement Association. Founded in 1967, the WIA is a private nonprofit organization dedicated to improving Waikiki's physical environment. Its 158 members include property owners; hotels; retail companies; travel and tour operators; transportation and service providers; and professional, community and social organizations. WIA works to secure capital improvement funds for Waikiki, improve the investment climate and foster long-range planning and partnerships to develop and maintain its image as a safe, vibrant, culturally and historically significant destination. In partnership with the City and County of Honolulu, the WIA presents other popular Waikiki events and activities as well, such as Brunch on the Beach, Sunset on the Beach and nightly torch-lighting ceremonies and hula performances on Kuhio Beach. For more information, call 923-1094 or visit the Web site www.waikikiimprovement.com.